Processing and Installation of Granite, Marble, Quartz and Natural stone custom fit to your design. Engineered stone is a man-made product consisting of 94% quartz, 6% polymer resin and pigments. These go under the following brand names: Caesar Stone, Sile Stone, Technistone, Hanstone, Samsung stone to name a few. Engineered stone is highly durable and has the following characteristics: non-porous, scratch resistant, moderate heat resistant, harder than granite. The colour is uniform and the material is easy to maintain. To clean you simply use a mild detergent and water. Chemicals with a Ph level higher than 8.5 will over time damage the surface. Engineered stone is not suitable for exterior applications as the suns UV rays will affect the material because of the resin content. Geologically, marble is a metamorphic rock consisting of fine coarse-grained recrystallized calcite and or dolomite. Commercially, the term marble is used to describe any crystallized carbonated rock including true marble and certain limestone types that are capable of being polished. Travertine while not a true marble is usually included in the commercial definition. A true marble of pure calcite or dolomite would be white. Marbles are coloured because of the impurities found in them. Some impurities one would find in marble are: iron oxide carbonaceous minerals, mica, chlorite and silicate. Generally the flexural, compressive strength and abrasion resistance in marble are lower than those found in granite. Marble is a porous material, as it was not formed by heat. Thus marble is not an ideal material for kitchen work surfaces. Marble is most commonly used for its beauty in architecture, sculpture and interior designs. 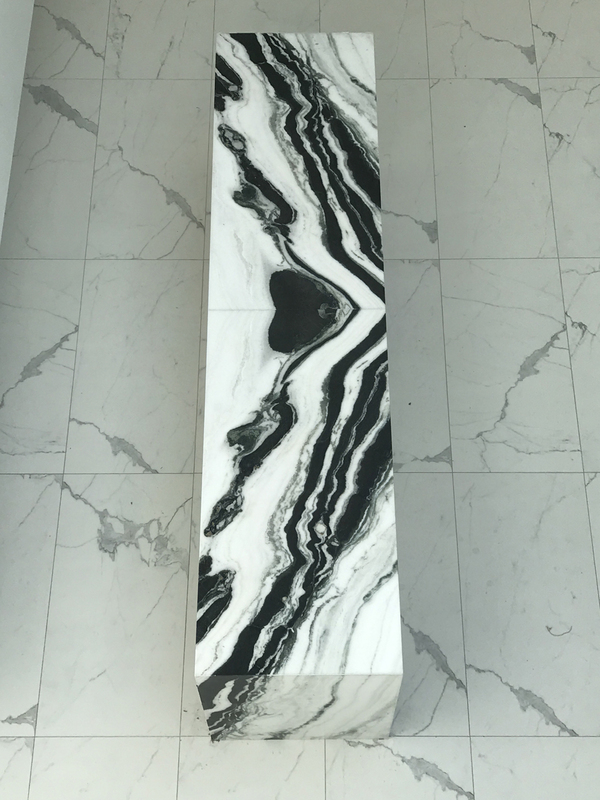 The resistance marble has to abrasion, which is a function of cohesion between grains as well as the hardness of the component minerals, makes it a viable option for floor and staircases. Additionally, marble is used for table counters and novelties. However, it is also known to be used for its chemical properties in pharmaceuticals and agriculture. When using marble for exterior purposes it is important to note, the marble should be uniform and non-porous to prevent the entrance of water which may discolour the stone or cause disintegration by freezing. We manufacturer and install all our own products. The process is very simple, but may be time consuming, especially for tiling when time is needed to allow for drying. 1. Measure the area you would like to place marble (Bathroom, Kitchen countertops, floors, etc.). 2. Choose the marble colour you would like to use. 3. Cut the marble according to size. 4. Remove your old countertops or flooring. 5. For flooring, level the flooring. 6. For countertops, check the marble that it fits before gluing. Start the flooring section by section, allow time for the marble to dry properly. 7. For countertops, add backlashing. Add grouting for flooring. 8. For countertops, glue in place. 9. Clean the newly installed marble. Granite is as old as the earth. It is liquid from magma, the molten rock found at the core of the earth, cooled slowly to form a substance approaching the harness and durability of diamond. Granite is igneous rock, the name reflecting its fiery beginning. Granite owes its hardness and density to the fact that it has been solidified within the earth under extreme pressure. Over time, seismic activity has changed the crust of the planet, forcing veins of granite to the surface. Granite are formed of an aggregate of crystals which are moulded together without interspaces between them or which enclose one another. The magnificent crystallinity of the granite is a striking characteristic. - Due to the resistance level of granite, placing hot items on the surface will not damage it. - Cutting on granite will no damage the surface. - Once sealed, granite is stain resistant. Granite is a tough, durable rock making a viable solution for both exterior and interior applications. Granite is able to resist most abrasions, tolerate significant weight, resist various weather conditions, and accept a polish. This makes it desirable for multiple uses. Common uses: Rough-cut and polished granite is used in buildings, bridges, paving, and monuments amongst other exterior projects. 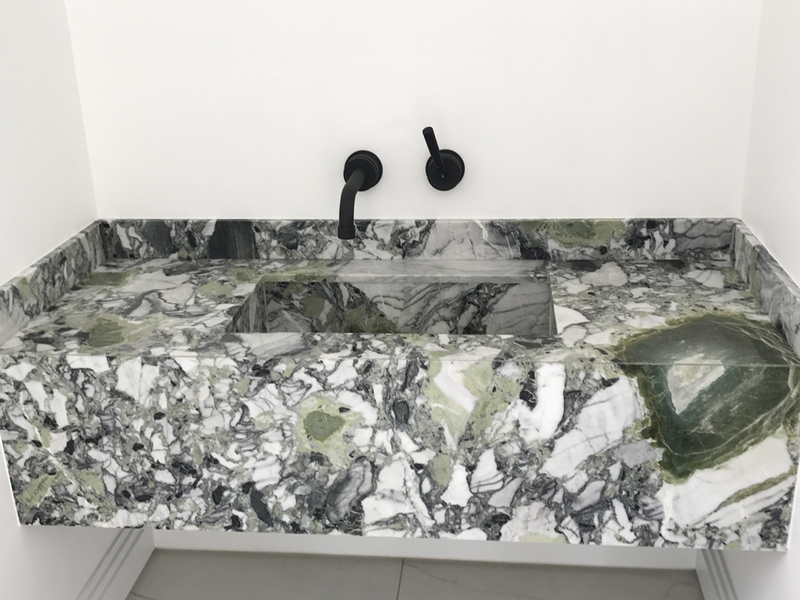 Polished granite slabs and tiles are used indoors for countertops, tile floors, and stair treads amongst other practical and decorative features. We manufacturer and install all our own products. The installation process is a simple process. 2. If you using the granite as kitchen counter-tops or in the bathroom, choose your basins and baths as this will affect the size and shape of your counter-tops. 4. Create a template to cut your granite accordingly. When creating the template, be sure keep the area of clear of any objects. This will make the process more efficient and effective. Your objects will also be able to remain dust free. 5. Cut the granite according to a template to fit around your basins and bath, if necessary. 6. Install the granite. Prior to installing be sure your installing area is clear of all objects.